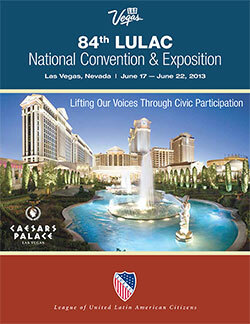 The League of United Latin American Citizens invites you to participate in the 84th Annual LULAC National Convention & Exposition in Las Vegas, Nevada from June 17 through June 22, 2013. As the premier Hispanic convention, the LULAC National Convention draws over 20,000 participants each year including the top leaders from government, business, and the Hispanic community. The LULAC Convention hosts the LULAC Federal Training Institute (FTI), an intensive and structured career development program for government and public sector employees. In partnership with the OPM and other Federal agencies, the Federal Training Institute offers workshops and plenary sessions that enable government employees and other employees to enhance their leadership skills and develop the Executive Core Qualifications required for entry to the Senior Executive Service. The convention also hosts the LULAC Youth Conference—a three-day event for Hispanic youth, featuring workshops and panel discussions education, career opportunities, community service and leadership. The Young Adult Conference features four-days of leadership development and policy workshops for college students and young professionals. On November 6th, 2012, Latino voters made it clear that comprehensive immigration reform was long overdue and that candidates who used anti-immigrant rhetoric would no longer fare well in future elections. Today, more than 11 million undocumented immigrants have incorporated themselves into the social and economic fabric of American culture, but still live in the shadows. A broken immigration system continues to stagnate their full contributions at all levels. Attendees will have the opportunity to come together with diverse stakeholders to discuss past strategies and key messaging points used by advocacy groups. The United States, home to over 50 million people identifying themselves as Latinos, currently spends about $2.6 trillion a year on health care costs, and yet ranks 37th in the world for quality of care. Obesity related ailments account for up to 21% of this price tag. By the year 2030, nearly ½ of all Americans will be 30 or more pounds over a healthy weight, qualifying them as obese. Nearly 40% of Hispanic children and adolescents are overweight and obese, compared to less than 30% of white youth. As the nation’s largest, fastest growing, and most under-insured population, Latinos will bear a substantial burden in realizing their right to a healthy life. This town hall addresses the multiple factors that impact the disparities Latinos face in their health. Partnertship Luncheon, Las Vegas Night Concert, Unity Luncheon, Youth & Young Adults Awards Banquet, Women's Luncheon, Presidential Awards banquet, and Concierto Voces Unidas por America. La octogésima cuarta Convención Nacional Anual y Feria de LULAC abrió hoy sus puertas en el hotel Caesars Palace. Los organizadores esperan que 20,000 personas participen en las exposiciones de la Convención, que serán gratuitas y abiertas a todo el público desde este martes 19 hasta el viernes 21 de junio. According to the Congressional Budget Office (CBO), Senate Bill 744 would add significant economic benefits – silencing anti-immigration advocates who claim immigration reform would be a drain on the economy. Increases in federal and tax revenues are expected due to increases in income and payroll taxes. During the Federal Training Institute (FTI) in Las Vegas, Nevada, LULAC discussed programs and opportunities in the Federal Government that will be focused on providing students, recent grads, veterans and those re-entering the workforce with a pathway to federal careers. Vice President Joe Biden will deliver a keynote speech at the League of United Latin American Citizens (LULAC) 84th annual National Convention June 20 in Las Vegas.